Beatrice Tonnesen’s favorite photographic subjects were beautiful women and scenes from family life. The latest additions to my collection feature a number of images from both categories. I’ll be posting some great “new” family-themed prints, as well as several newly found images of the toddler in Tonnesen’s “Sunny Jim” series this fall. Unnamed lady wearing a dress that was one of Tonnesen’s early favorites on an unmarked 1921 calendar. 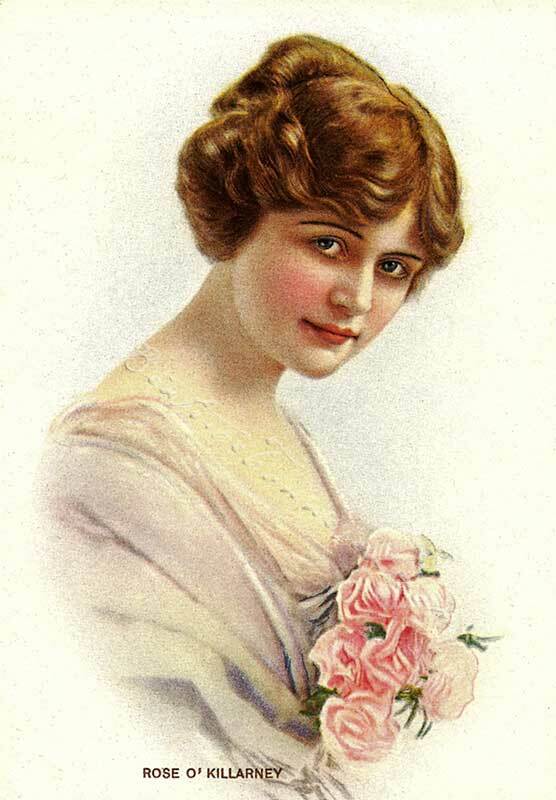 “Anne,” appearing on a 1922 calendar marked only “Nr. 322 Hand-Colored.”Anne sits on Tonnesen’s swing, wearing Tonnesen’s dress. “Sweet Alice,” a model who appeared often in advertising during the late teens and early ’20s, as well as in a number of Tonnesen’s images, and who wears one of Tonnesen’s dresses on a 1923 calendar, published by R.C. Co. NY. A purported biography of Alice appears on the calendar backing underneath the print. However, it must be fictional, as it describes her as a socialite who was not a professional model. “Dimples,” on an unmarked calendar back. It is a companion piece to an image in the collection of the Winneconne Historical Society. 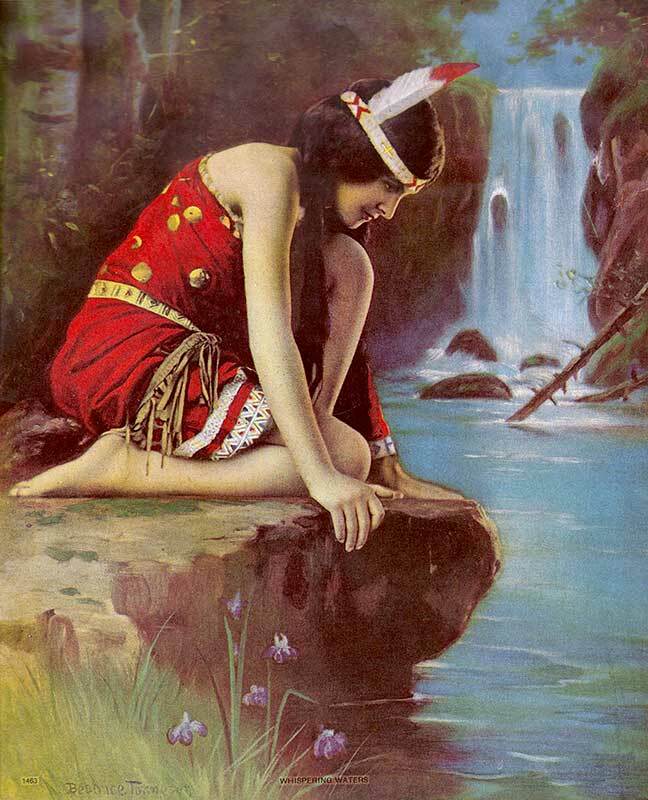 The model is believed to be Eva Grady (1899-1934). Untitled, on an unmarked 1932 calendar. This is part of a series of photos taken by Tonnesen at the end of her career in Chicago. Others in the series appear in Album 9 of the Image Catalogue that can be accessed at the top of our home page. I believe R.A. Fox’s print “Meditation” originated from a photo in this same series. Back in March of 2012, we posted images of three glass negative plates produced around 1900 in the Tonnesen Sisters studio and provided to us by Lee Grady, archivist of the McCormick-International Harvester Collection at the Wisconsin Historical Society. Now, we have found an example of the full color print that resulted from one of the glass negatives. Interestingly, the printed image is the reverse of the negative image! Here is the newly found color image (of the young boy with the bearded man), along with the entire original post from 2012. Recently, Lee Grady, Archivist for the McCormick-International Harvester Collection at the Wisconsin Historical Society wrote us with information concerning some glass negatives, or glass plates in the historical society's collection. 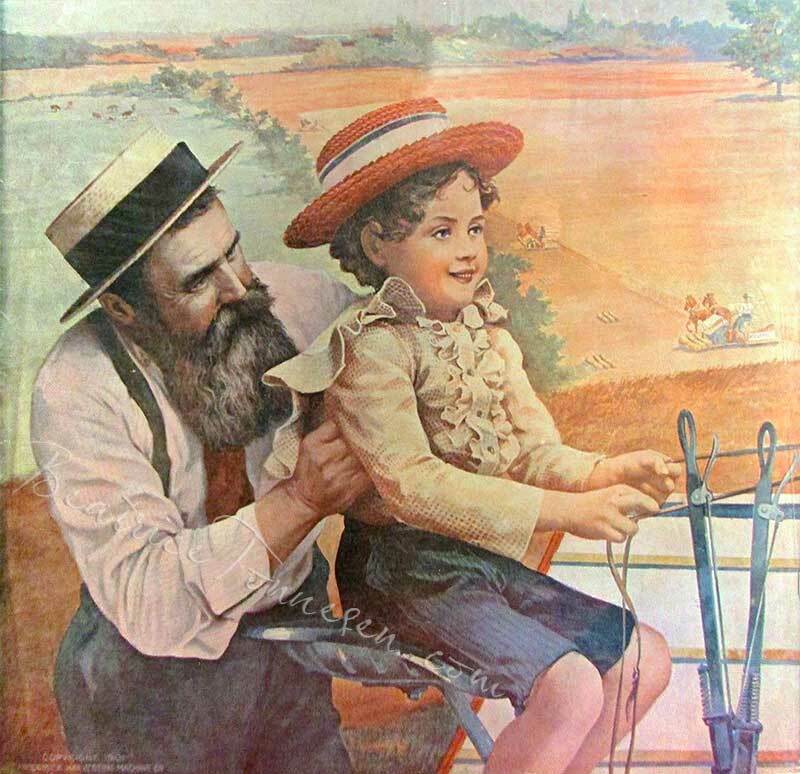 From roughly 1900 through 1930, the company produced a series of calendars and posters promoting a wide range of farm implements. He had discovered that two of the negatives were marked “Tonnesen Sisters” and, though the company often shot its own photos for advertising purposes, there were others that were unmarked and unidentified. The collection contains about 500,000 photo-based images, about 12,000 of which are in the form of glass plate negatives. So it was impossible to look at everything. But Grady selected about a dozen Tonnesen “maybes” and sent them to us. As of now, after examining the clothing and the props, we have identified only one more, for a total of three, but we will keep searching! 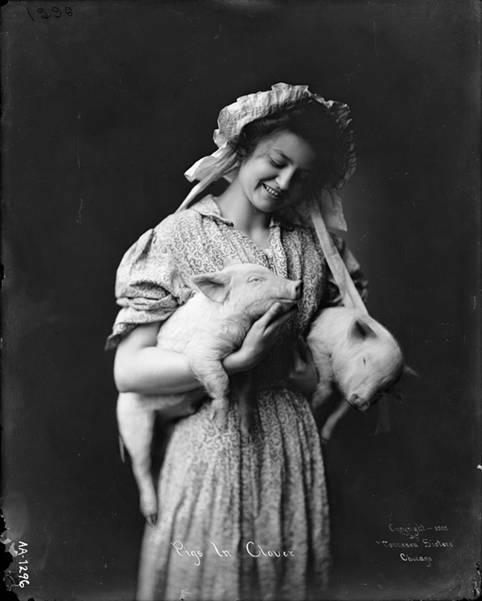 “Pigs in Clover” by the Tonnesen Sisters. The model, often seen in Tonnesen's work ca. 1900, wears a dress that seems to have been one of Tonnesen's favorites. It appears in “The Hay Seed,” shown elsewhere on this blog, probably the most popular of her early photos. An original photo from this glass negative is owned by the Oshkosh Public Museum. The Tonnesen Sisters signature appears in the hay at bottom left. On the back is written: “International Harvester Calendar Design $75. Dorothy”. The name “Dorothy” is one of several noted on the backs of various photos during that time. I think it may refer to the person who handled the details of the transaction. It appears that IHC bought the negative for $75! This is the finished, colored 1902 poster that started as the photo described above. I am virtually certain this image was created by the Tonnesen Sisters, based on the fact that the child is wearing the same shirt and overalls, and probably the same hat, as the child in Image #2. I also think that this child and the child in #2 are one and the same. 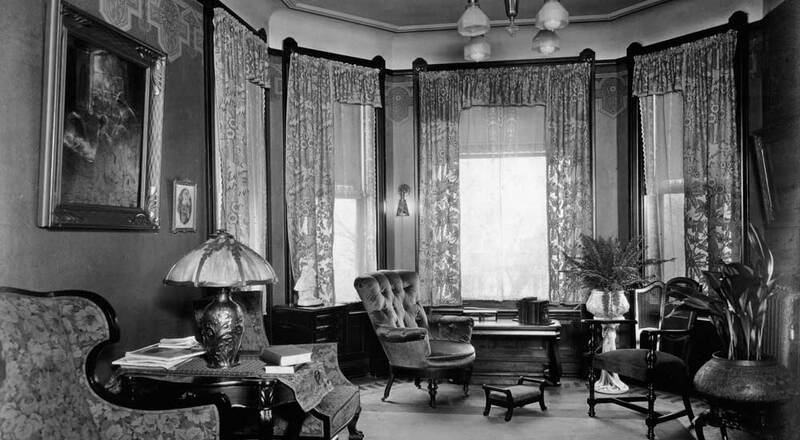 These, and thousands of other images, including company and family photos, as well as vintage artwork can be viewed, and in most cases purchased, at Wisconsin Historical Society. Back in January, I posted a 1919 calendar print titled “A Little Bit of Heaven.” Published by The K.T. Co from a photo and painting by Beatrice Tonnesen, it featured two little girls in a setting of filmy drapes and daisies. 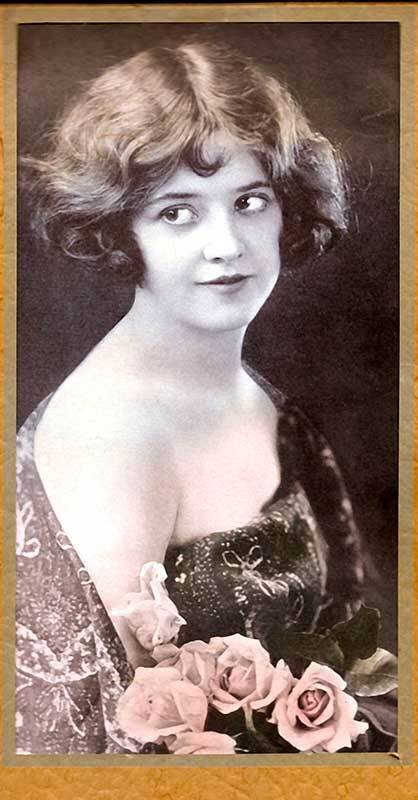 At the time, I knew one model to be Virginia Waller (1913-2006) and I suspected the other to be Lucille Ricksen (1910-1925), who left Chicago for Hollywood in 1920, found stardom and died tragically five years later. After I posted the image, silent film expert Michael Ankerich confirmed Ricksen’s identity. Now, in May, I find myself frantically trying to organize my Tonnesen collection in preparation for our impending move from England back to the US. In sorting through a box of prints I hadn’t thought of in ages, I found this previously unidentified gem. 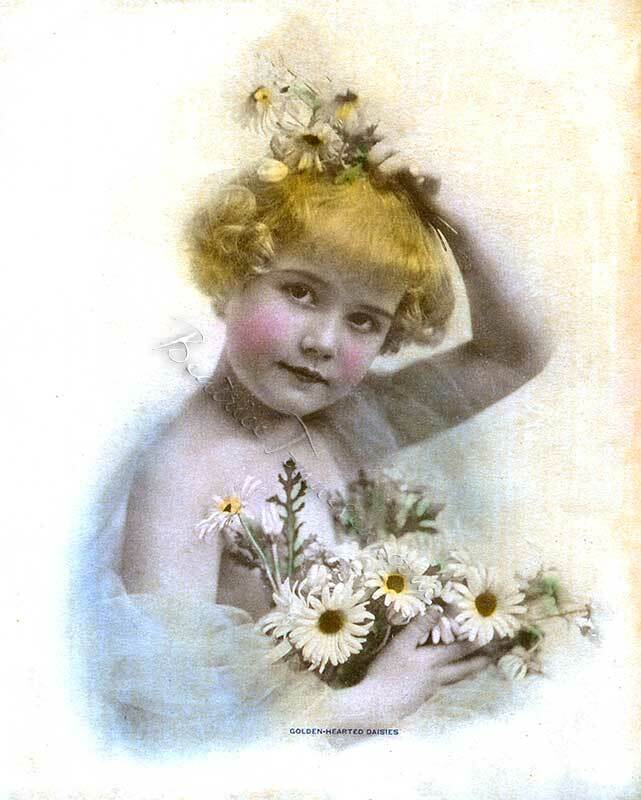 With “A Little Bit of Heaven” implanted in my recent memory, I recognized Lucille instantly in this unsigned, undated print titled “Golden-Hearted Daisies.” I also recognized it as “Heaven’s” companion-piece, two images- both later published as calendar prints- that no doubt came from one photo shoot. Titled "Whispering Waters" and signed Beatrice Tonnesen, this calendar print is believed to feature Mary Simmonds O'Grady. Though this particular print is undated, I have seen it on a 1925 calendar. Separation Anxiety: TDM’s “Rose O’Killarney” Has Me Wondering! Thomas D. Murphy Calendar Co.
Now, however, I have an answer of sorts, but it raises other questions. 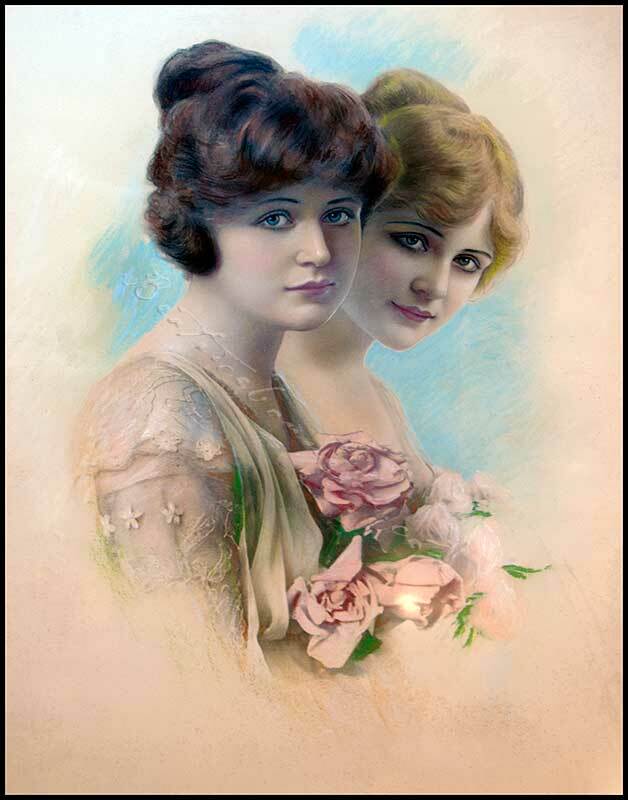 I recently found a 1919 calendar with a print of one beautiful woman – not two – and the woman is clearly the same one who appears on the right side of the original painting. Titled “Rose O’Killarney,” her solo calendar appearance matches every detail shown in the painting, right down to the green sprigs peeking out of her rose bouquet. Interestingly, since in the painting she was partially obscured on the left by her companion, the calendar illustrator had to fill in some missing areas when the two subjects were separated. But wait! Could it be that the painting was formed and painted from two separate photos, with “Rose O’Killarney” being one of them? In that case, the calendar illustrator would have had a complete photographic image of Rose with which to work. So now, I wonder, is there a calendar print of Rose’s friend out there somewhere? Or is there a calendar somewhere that shows the two beauties reunited? Did TDM get two, or even three, calendar prints for the price of one painting? Or did they, perhaps, purchase two separate photos from Tonnesen, and then position and illustrate them together for the painting? Included here, are images of the original painting, along with the calendar print of “Rose O’Killarney.” For more examples of curiously constructed prints with elements by Tonnesen, please see Album 12, “Tonnesen Images Make Mystery Appearances” in the Beatrice Tonnesen Catalogue. 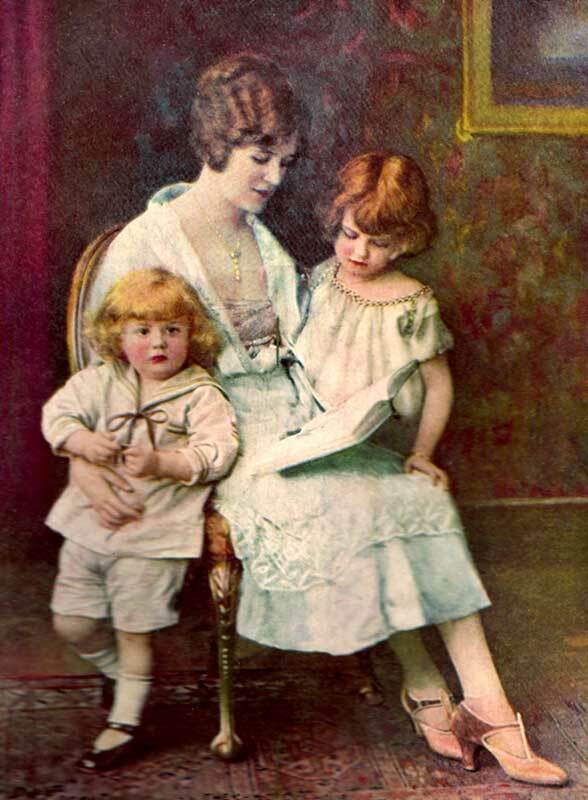 Around 1923, Tonnesen created a photo portraying a beautiful young mother reading to her two children. The scene went on to become an unsigned calendar print titled “The Morning Lesson.” “The Children’s Hour” is a variation on “The Morning Lesson” – same people, same clothing, same theme – only a different placement of the people in the room and different coloring and illustrated backgrounds. So it’s likely that both source photos were the products of the same photo shoot.